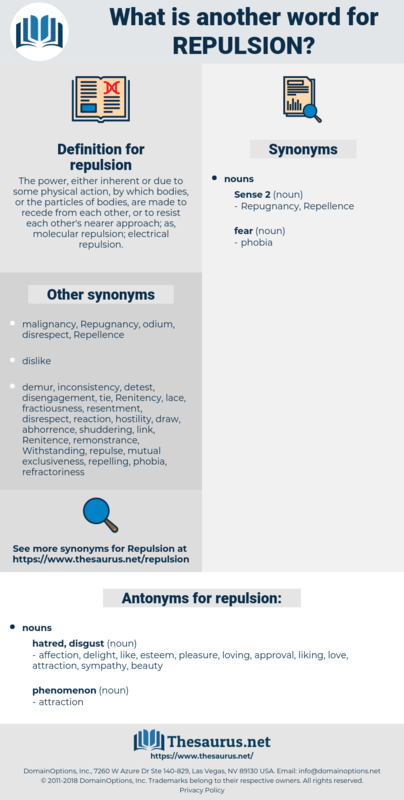 What is another word for repulsion? 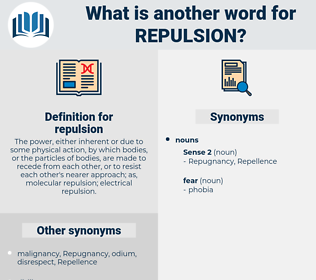 The power, either inherent or due to some physical action, by which bodies, or the particles of bodies, are made to recede from each other, or to resist each other's nearer approach; as, molecular repulsion; electrical repulsion. affection, delight, like, esteem, pleasure, loving, approval, liking, love, attraction, sympathy, beauty. bent, favor, fondness, attractive force, affinity, predilection, harmony, partiality, kindliness, preference, regard, shine, relish, use, propensity, fancy, agreement, penchant, taste, congeniality, appetite. A cold feeling of horror and repulsion stole over Paul as he listened. Bobby hesitated, fighting back his feeling of repulsion, his first instinct to refuse. reflexion, revulsion, republican, rabelaisian, revivalism.